The 3000ft mountains of Wales are conveniently all contained within the three mountain groups of northern Snowdonia – Carneddau, Glyderau and Snowdon. Had Aran Fawddwy or Cadair Idris been a few feet higher it would be a very different story. As it is, the traverse of all fourteen summits in a day would have been an obvious challenge even in the 19th century, though the first recorded completion was in 1919 by a Rucksack Club party led by Eustace Thomas. By contrast, after the Ordnance Survey went metric in the seventies, the traverse of the four 1000 metres peaks, two in the Carneddau and two on Snowdon, has neither the same logic nor the same appeal. However, the 1000 metre peaks race, held at the beginning of June every year, makes the best of the situation by starting at the sea, near Abergwyngregyn and finishing on the summit of Snowdon. In The Mountains of Snowdonia by Carr and Lister, published in 1925, it is noted that: Strong walkers will not visit Snowdonia many times without wishing to include the Carnedds, the Glyders and Snowdon in a single expedition, and the visitors’ book of the Pen y Gwryd Hotel reveals that a traverse of the Fourteen Threes, if not necessarily accomplished, was often on the agenda of guests staying there. 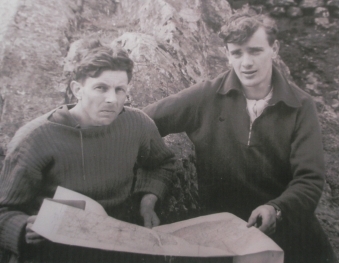 During the thirties, times taken began to come down, with W. Stallybrass walking from Snowdon to Foel Fras in 13 hours 20 minutes, Showell Styles the well-known writer, in 12 hours 44 minutes and Frank Shuttleworth in 10 hours 29 minutes. The precision of these times suggests that these were not casual outings but record-breaking attempts. However, the first person to take the record really seriously, in 1938, was Thomas Firbank whose farm Dyffryn Mymbyr lay on the southern slopes of the Glyderau. Subsequently, a chapter was devoted to the walk in his highly readable best seller I Bought a Mountain, ensuring that the “The Fourteen Threes” has been well known ever since. Firbank’s description of detailed planning, reconaissance, training, schedules and support teams has a very modern ring to it and it all paid off when his team of three (which included Stowe School housemasters Rex Hamer and Eddie Capel Cure as well as himself), despite poor weather including an "impenetrable fog blanket" on the Carneddau achieved a time of 8 hours 25 minutes. It is also worth remembering that there was a lack of footpaths at that time, adding to the navigational difficulties. His wife, Esme ( who later remarried and, as Esme Kirby, founded the Snowdonia Society in 1968) accompanied by the farm shepherd, Thomas Davies, set a new women's record of 9 hours 29 minutes. Such fast times were made possible by running most of the downhill sections. In training, Rex Hamer descended from the summit of Tryfan to the A5 in 13 minutes, a feat unlikely to have been matched very often since (although in the 80s alpinist Trevor Pilling claimed to have done it in an astonishing 8 minutes). Running in the mountains was a new departure, as was the blaze of publicity that followed their success and eyebrows were raised in the mountaineering establishment. Much of the publicity was occasioned by Esme’s presence, female mountaineers still being something of a novelty. It would be many years before people like Helen Diamantides and Lizzy Hawker were to show that at ultra – distance running women could be at least the equal of men. Firbank abhorred the fuss, but Esme seems to have relished it, travelling down to London as the guest of the BBC and featuring in a number of national dailies. So strong was the disapproval in the mountaineering world that Hamer and Capel Cure felt obliged to write a letter of apology in the Climbers' Club Journal, though that did not stop either running or the interest of the press when it scented a good story.